Discuss all world related and upcoming world related topics in this thread. Below is a list of worlds that are currently playable in the Kingdom Hearts universe, from both released and unreleased games. Be sure to read the rules below the topic before posting. The following is a list of Disney films which have yet to be featured as worlds in the Kingdom Hearts universe. Films in red indicate that the film has been hinted to exist as a world within the Kingdom Hearts universe, likely due to characters from those films already making appearances in the franchise in forms such as summons in the main series or medals in Kingdom Hearts Union X. Do not respond with list-only posts. If you do decide to list worlds you'd like to see in the series, be sure to include an explanation. An explanation consists of more than one sentence! If you post just a list with no reason to why you wish to see a world, your post will be deleted. It is highly encouraged that you respond to previous posts. It is just common courtesy and nobody likes to have their ideas ignored. If there is a topic specified in the thread title or poll, please discuss the topic. It is there for a reason. Please try to elaborate your point as well as possible. All posts that say "I agree", "This", etc. will be deleted. If you feel something is missing or wrong in OP, please send me a Private Message. Re: Worlds of Kingdom Hearts - What worlds do you want to see in KH3? For reference, this is the link to the last page of the previous Worlds of Kingdom Hearts thread. I want the Kingdom of the Sun, and for Kronk to be revealed as a keyblade wielder. Patrick Warburton and Sora teaming up to fight Ansem? Of course. I really want them to include Agrabah one last time, and do The King of Thieves storyline. It would be a great end for the world to have its third installment included in the "third installment" of the Kingdom Hearts series I think Also, all the different areas and characters introduced in the film would be a welcome addition to the world. 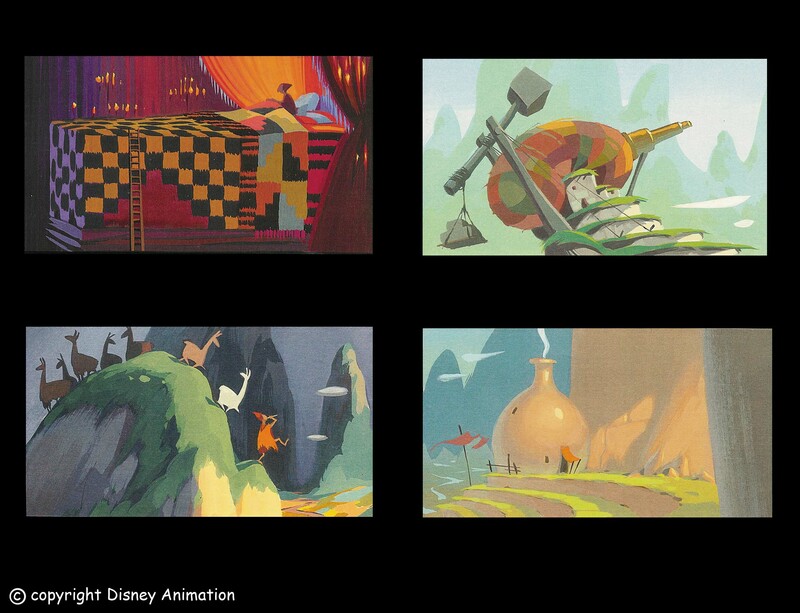 We all want Emperor's New Groove ;A; They could make really impressive areas, especially if they draw inspiration from both the movie and concept art. 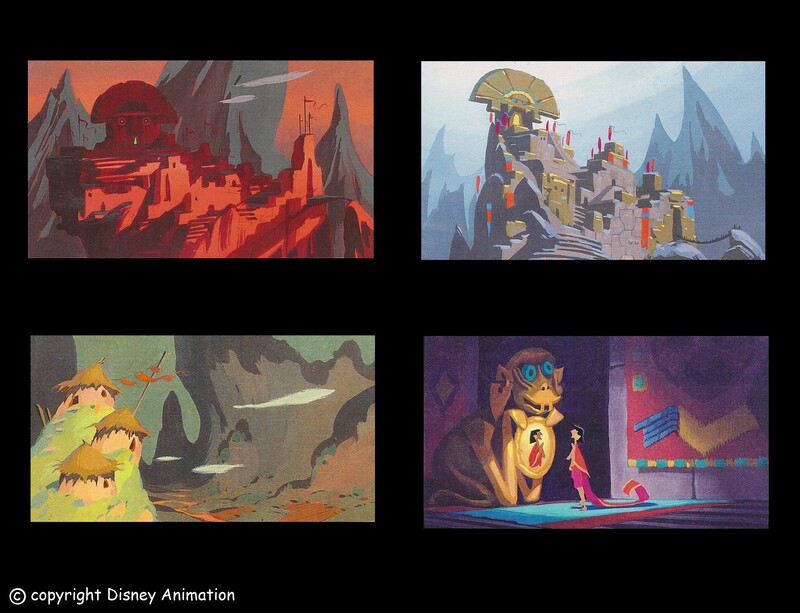 I'd love to see Kronk to be a Keyblade wielder out of the blue, or at least a potential one. "One time I had this crazy dream I was standing on some stained glass platforms and those little monster guys were attacking me. Oh! Spinach puffs are ready!" Kronk: *watching as SDG are struggling with some Heartless* "Hey, short spiky haired kid, you look like you need some help." Kronk: *breaks Sora's fall and smiles* "No, no. Let me! *summons a Keyblade*"
Definitely! The King of Thieves was probably one of the best movie story arcs from a direct-to-home Disney movie. Cassim is one of Disney's best dads, and I would love to see SDG+MR interact with him given the chance. They could give Cassim advice on how to approach being a good father, or that he doesn't have to live the life of a thief. Not to mention Sa'luk would make the best world villain. He's evil, conniving, and I can see him becoming a crazy boss via the Darkness + Midas' hand. Hawaii would be fantastic. I want Stitch to say "Ohana means family, and family means nobody gets left behind" and then hold out the Wayfinder he made back in BBS to Sora ;A; And then we could see a flash of TAV and it'd be all emotional. 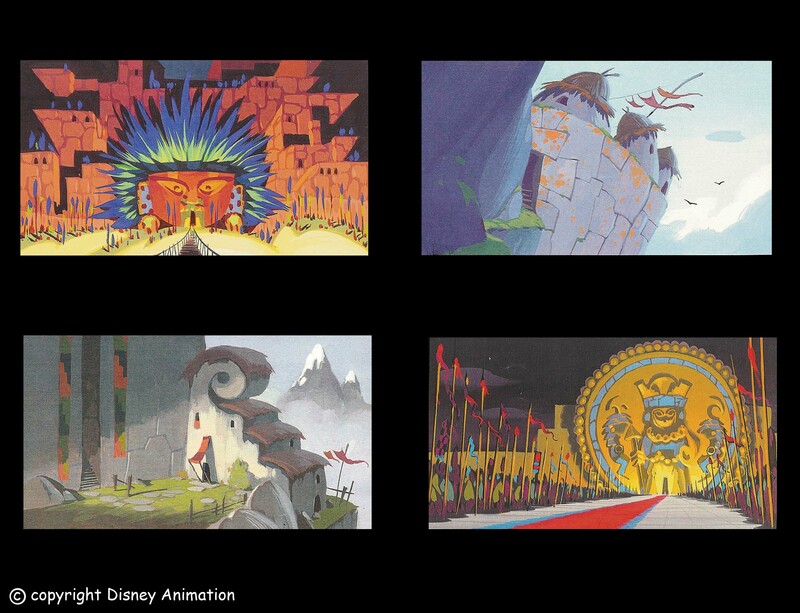 I would love to see Emperor's New Groove. It has gorgeous environments that I feel would benefit from the power of next generation hardware. Plus, it's just a golden Disney film, IMO. I love the characters and adored the villains. It's comedy is clever and I believe KH would only raise the bar for its established lore. This would primarily act as a comedic side world. It would be fun, light hearted, but clever. Beyond that, Gargoyles is my dream world. It's dark, moody, and shakespearean characters would contrast well with our traveling trio of amigos. Having Goliath as a party member would be empowering. And, overall, if the world was anchored to the main plot, it could establish deeper ties to the Gargoyles mythology. I think Gargoyles would also benefit as a world that you would return to as the plot progressed, further entrenching you in the world, and opening up other areas. If anything, this would be a world where a major plot twist could unravel, and proper development against its gothic backdrop. Finally, with Disney owning the Star Wars license, I would LOVE to see a Star Wars world, if only as pure fan service. Like Space Paranoids. Kingdom Hearts all ready shares several very deliberate plot motivations with Lucas' magnum opus, and it feels poetic enough for a Star Wars to play a major factor in the third installment. There is no one world that, IMO, represents the entirety of the Star Wars universe and brand. Tatooine is debatable, but it's far too close to Agrabah. The Death Star is pivotal to the entire Star Wars franchise; it is the setting for the trench run. It is the flocation of the final battle between Obi-Wan and Anakin. It is also the fateful redemption of Anakin Skywalker, when he saves Luke from the Emperor by sacrificing his own life. To best use the Death Star; it should be Darth Vader that becomes your team mate. And you enter during the incredible battle above Endor. You would be there as Anakin redeems himself from the darkness in his heart, and this could establish a major plot for Sora, as he learns anyone can be pulled from darkness. Even after they have embraced it. Perhaps it could be a world visited during the third act, after a terrible event has befallen Sora and his companions. Sora's faith is shaken, but Darth Vader's emotional sacrifice leaves an impression on Sora. A renewed passion to save the worlds and his friends. This course best takes advantage of Star Wars and the brand's marketing. Darth Vader is THE icon of Star Wars, so he is the ideal candidate as a party member, and the Death Star represents the entire Star Wars universe. A critical junction of the conflict between light and darkness. Master you forgot Hocus Pocus, and The Black Hole. I just wanted to share my personal opinion on what worlds i think should be in the game. I previously posted this on the gamefaqs KHIII board but i feel it'd be much more appreciated here in this forum. First i'd like to point out that i DON'T want any Star Wars or Marvel related worlds in the games just for the fact that Kingdom Hearts III will already be an epic game without these specific franchises. I think that the whole story and the elements presented within the movie would fit really well within the KH universe as we deal with an enemy (Shadowman) that uses dark magic. The whole story surrounded within this world would be having S/D/G helping Tia and Prince Naveen become human and also have a back story of the Organization thinking that Tia is a new Princess of Heart. I really enjoyed the movie because it was really entertaining. Basically it would run the true course of the Tangled movie except we’d have Mother Gothel who is a witch summon a giant heartless to combat the protagonists while protecting Rapunzel and bring her back to her true parents. And another back story with Organization trying to capture another Princess of Heart. Who wouldn't want this in Kingdom Hearts?! I mean the character models for Buzz and Woody were in KHII and its about time they were in KH game lol. I picked the 1st Toy Story movie because Sora would need to get to know the characters first and develop bonds. I can imagine in this world that we'd be fighting new toy type heartless or even just evil toys that are specific to that world. I just believe that you cant leave the Pirates story hanging just after the first movie. It'd be interesting to see how KH would interpret Davy Jones and also with the Kingdom Shader that will be used with each specific world..the Pirates world would be 100x better than what it was in KHII. Also i could imagine a new type of pirate anemy like the ones who were cursed on the Flying Dutchman. Also large scale boss battles with Davy Jones much like the climatic fight where the Black Pearl and the Flying Dutchman were swirling around each other in that whirlpool. Form Change: Sora Donald & Goody becoming monster versions of themselves. Other than Toy Story, this would probably be my favorite Pixar movie. I can see Sully being a powerhouse party member like the Beast. Story wise, it would just be the exact same the movie except we probably have the organization manipulating Mr. Waternoose to the point where he becomes a Heartless. Tetsuya Nomure even wished that this movie was apart of KH but licensing restrictions prevented that. (watch E3 2013 interview). I could just see this Jungle Book world being a lot like the Little Mermaid one from KHII with musical mini games to cut the drama and action with fun and more lighter tones and i think that KHIII can enhance that feeling but in a greater fashion. Who didn't love the songs from that movie?! Admins feel free to move it in case i put this in the wrong place. Was the sultan ever even mentioned so far? Also i'm pretty much hoping for a tangled world now..though i remember reading this somewhere...idk if it was in this forums but it was said one of the reasons the voice actor of Eugene voiced him was because he was hoping he'll be able to voice for kh..so is that true? I would love to see Rapunzel finding Donald in the closet in the beginning of the world and then banging him in the head with the frying pan. The one movie I would LOVE to see in the next installment would be "Who Framed Roger Rabbit?" This movie was not even mentioned in the plethora of movies listed above, and I believe it would fit perfectly into the KH series now that they have the new Kingdom Shader to work with. This could really be cool having Roger team up with you, mixing toon elements with more realistic features with the Kingdom Shader to outline how this world could look. Just a thought. I completely agree, it would be cool to have them tackle this storyline. It would also fit with the series so far as it did the first Aladdin in the first KH, the second in KH2, so logically KH3 will have the third movie. I just hope they'd actually try and include at least some of the new characters and not just replace them all with Heartless like they've done before. Also, please let us finally enter the palace. I also want really want to see Lilo and Nani, I think it's sad that even though Stitch appeared in two games, both Lilo and Nani have yet to be even mentioned. Thoug I personally wouldn't be surprised if the story of Lilo & Stitch was already over when SDG come to Hawaii, seeing Stitch was already playing the Ukulele and had a Hawaiian background when summoned, though this could have also just have been foreshadowing. I actually want him to meet up with all of TAV seeing they all were his first friends. Though he seemed especially close to Ven and Aqua. This is definitely one of the worlds I want the most. Lilo & Stitch is probably one of my all time favorite Disney movies or movies in general. So getting to interact with these characters is something I want really badly. That would be quite random and weird considering he's suppose to be one of the villains, even if he's not all that evil. I wonder if we do go there will they actually do all the crazy animal transformations. I wonder what SDG would turn into in that fight. Imagine Sora turned into a kitten and Donald and goofy turned into a real duck and a dog while fighting Yzma. Really? He kind of abandoned Aladdin for years and only really got back in contact with Aladdin because he sought him out. That said I still think the scenario in which SDG try to teach him to be a good dad would be fun to watch. I completely agree with Sa'luk, he'd be a great boss fight, and fighting in the Temple would probably also be pretty neat. I really like that idea. It be pretty great to see him still having his Wayfinder and thinking of TAV. Yeah I think in KH2 Jasmine said she had to go warn her father and I think he's been mentioned in most of the games, but he never made an actual appearance, which I find sad because I found him to be a funny character and feel he'd missing in KH. I never heard of that, if it's true that's pretty cool. Either way I really want there to be a world based off of this movie, it has some great areas that I really would enjoy exploring and great characters that would make it very enjoyable. Why would Lilo and Stitch's first movie become a rhythm game? It had little to nothing to do with music in the movie. as for the lilo and stitch world, it would be sweet if aqua and stitch reunited in hawaii. Thank you, but I must disagree. Facing the Emperor, who has a host of varying powers, would be a far more intricate and memorable battle. I just believe turning circumstances on its head, and allying with Vader would be more rewarding, especially if it ended with the player aiding in the ultimate defeat of the Emperor. It's a far more powerful moment. i would really like for lilo and stitch to make a return so that aqua and ven could reunite with stitch i really belive thats what nomura planed on doing any way i also would like for angel to be in the lilo world even though for the first movie that wouldnt match i just love her. i also want gargoyles to make an apperance halloween town is tired its time for a new dark disney franchise o take its place goliath would make a great party member and since its a show can be a world that gets revisited in the next saga after the seeker of darkness chronicles are done.the gargoyles also went through a similar betrayl like tav twice with the humans in their original timeline and then with xanthos who would make a cool boss with suped up darkness powers. i think atlantica should not make a return until the next saga only because the only story they could tell would be with melody and that cant happen unless time moves diffrently in each world. it should be replaced with atlantis the lost empire and have princess kida be the party member. i too think star wars should be represented in the series and if you travel to each world twice or more times like khii then first time you can fight darth vader and on the return team with him to defeat the emperor and save luke and leia. plus who wouldnt want an ewok summon lol. i also really want thor(not any of the rest of the avengers unless hulk is a summon even though having hulk try to smash donald duck would be hilarious) to appear doing the first movies story it can be a double world like halloween/christmas town. with asgard and midgard fighting loki and the destroyer would be fun and seeing thor and sora reacting to each others strange weapons would be pricless imo. i dont know anything about the movie since it hasnt been released yet but i think frozen too would be a perfect world if only for the setting. Keyblade Wielding Kronk is such a good idea that I'm getting my tablet out and drawing it. This is happening. Definitely have to agree. The world would look really great in HD, as well. With the Gargoyles myth, I'd love to see them know of the Keyblade wielders, perhaps even slightly look down on them for the Keyblade wielder's greed in the past. Sora could impart some pretty important lessons on trusting humans to Goliath, and Goliath can teach Sora how to be intimidating and a good leader. Dr. Facilier would be great as the boss. I'd love to see his magic used in a more combative way. Idk about the PoH thing. There are only seven of them and they already know where each of them is. I'd actually would want Rapunzel to be a party member. Flynn is cool, but Rapunzel has the more interesting skills. Again with the PoH thing, there are only seven. Unless one of them dies...which won't happen. I like the rest of your picks! Uhhh, maybe indirectly, but no. We should be able to go into the castle at the very least in KH3. That's be hilarious! I can picture this perfectly! Technically he was not a villain. He was Yzma's henchman, but he had a heart of gold and was super kind and we see how he couldn't bear to kill Kuzco and spent more time being a genuinely nice guy. Also villains get keyblades too unless you've forgotten Xehanort (and his incarnates) and Vanitas. They would need to! That was one of the best parts of the movie! Please share with us when you finish!